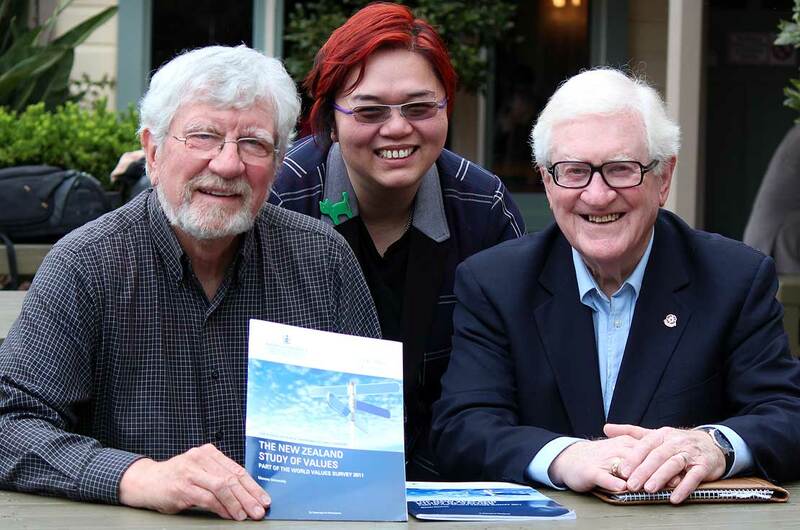 Gearing up for the next wave of the World Values Survey in New Zealand; Dr Paul Perry, Dr Polly Yeung and Professor Graeme Fraser. Questions about Kiwi values have been at the forefront of politics recently, with New Zealand First’s proposed ‘values’ bill for migrants and National’s meltdown over allegations about foreign donors, ethnic candidate selection and sexual conduct. A chance for citizens to describe their values is coming up with the latest World Values Survey, held every six years in around 70 countries. The survey asks New Zealanders to respond to questions on diverse topics to contribute to the world’s largest social science database. Massey University social scientists coordinating the New Zealand segment of the survey say it provides a rich source of data. The data is freely available to a wide range of researchers from universities, government and numerous social agencies, to international organisations seeking understanding and solutions to complex global issues. Dr Paul Perry, a sociologist at Massey’s School of People, Environment and Planning who has helped run the last five of six waves conducted here and is gearing up for the seventh wave, says it is vital for New Zealanders to take part. The survey, he says, explores people’s beliefs and values, how they change over time, and what social and political impact they have. He has been a principal investigator for the New Zealand survey since the 1980s and says current global tensions – including the rise of populist leaders, mass migration and massive, rapid demographic and technological changes – mean it is important we can see how our society is tracking alongside other nations. The survey is comprehensive, posing hundreds of questions, including on political participation and views such as; Should you be taxed to keep the environment clean? Is it OK to eat eggs from ‘battery hens? Have private prisons? Armed cops? Do you believe in God, global warming, or free-market capitalism? Questions come under a range of headings, including social values, attitudes and stereotypes; societal wellbeing; social capital, trust and organisational membership; economic values; corruption; migration; security; science and technology; ethical values and norms and a range of topics on politics (interest, participation, culture, regimes). The postal survey goes out to a random sample of over a thousand people drawn from the electoral roll. Data from the New Zealand survey results and the world survey more generally have been cited in thousands of publications, including books and journal articles, over the years, says Dr Perry, who is working with Dr Polly Yeung, from the School of Social Work, on the current survey. The World Values Survey was originally designed to test the hypothesis that economic and technological changes are transforming the basic values and motivations of the publics of industrialized societies. The surveys build on the European Values Study (EVS) first carried out in 1981. Dr Perry, an honorary research associate who has worked at Massey for over four decades, has published his own research on a wide range of topics, including attitudes to barking dogs and victims of dog bites to contraceptive knowledge and attitudes towards abortion in provincial New Zealand. He says research topics of most interest to him in recent times are; “environmental beliefs, and beliefs about what one might call neoliberalism or market fundamentalism. “In particular, the interface of these two areas has interested me. Much of the world in the last three to four decades has been shaped by the apparent ascendancy of beliefs in the free-market and minimising government intervention. Researchers are currently finalising funding for the costs of conducting the survey, which will be sent out early in 2019, and collated by the Massey team.